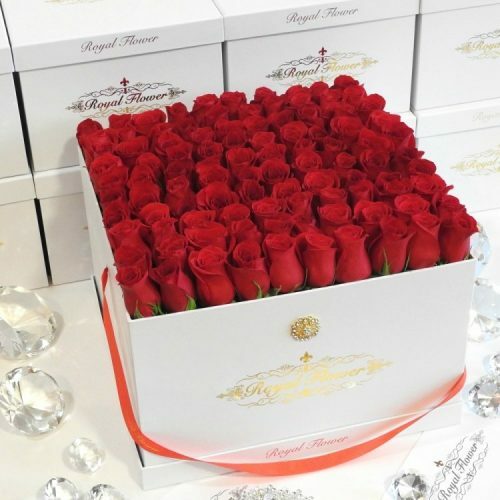 36-40 Hand Picked Royal Roses arranged beautifully in a luxury box, adorned with a very nice diamond* on the elegant red ribbon. Roses are one of the most natural and common beauties of the earth. They’re also one of the most preferred gifts for loved ones. This fabulous and spectacular arrangement of different color of roses in the Royal rectangular box is guaranteed to leave her/him speechless. 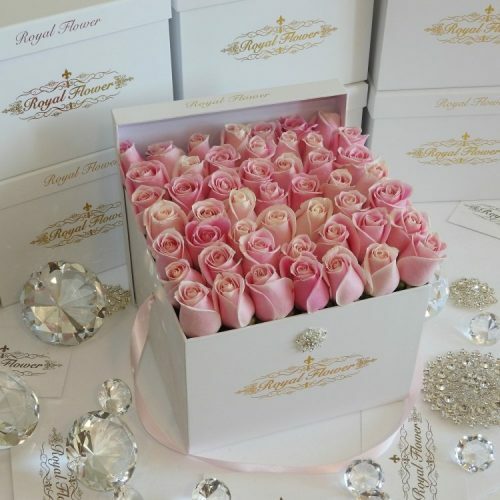 In this super luxurious arrangement there are 45-50 hand picked and hand crafted roses arranged perfectly and the box adorned with a very nice 1-inch diamond on the ribbon. The final look and length of the arrangement is almost one foot tall. Each box has waterproof container with floral foam that soaked in water and food for flowers. There is no need for any kind of watering or specific maintenance. The life span of roses are usually between 5 to 7 days and you just need to keep the arrangement in the cold to medium room temperature that roses last good and beautiful in their life span.